Jacob Bacharach, director of operations for the August Wilson Center, gives students a tour of the facility. The annual All-Access SAEM High School Summer Workshop, held July 11-14 this year, once again immersed students into the real-world business operations of sports, arts and entertainment management. Live entertainment and performing arts venues, recording studios and radio stations across Downtown Pittsburgh were among the sites explored this year. "Students were able to experience so much of what makes the City of Pittsburgh great," remarked Steve Tanzilli, J.D., associate professor of SAEM and chair of the Department of Management. Day one began with a presentation by Tanzilli, who talked to students about what it is like to work with professional athletes - and the legal knowledge necessary to work in the sports industry. 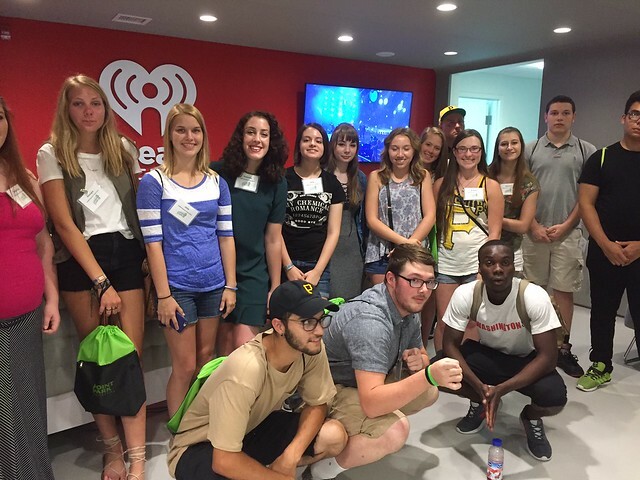 Later that day, SAEM Assistant Professor Paige Beal, M.B.A., took students to the iHeartMedia, Inc. studio in Pittsburgh, where Joe Seaman, senior account executive of iHeartMedia Pittsburgh, gave them a tour of the place and discussed business operations behind radio. Students also had the opportunity to see where live artists play and meet with popular radio hosts "Tall Cathy" from 96.1 KISS and Carson Blackley from BIG 104.7. On day two, students went to Stage AE to take a behind-the-scenes tour and explore Point Park's on-site classroom at the venue with Ed Traversari, M.B.A., SAEM associate professor. Students also met with Amy Cooper, Stage AE marketing director, and learned about Pioneer Records, Point Park's student-run record label, from Jesse Naus, part-time SAEM faculty member and owner of Red Caiman Studios. New this year, the SAEM program partnered with Point Park's Conservatory of Performing Arts, which allowed students to take a backstage tour of the Pittsburgh Playhouse on day three. Students then had the opportunity to discuss theatre operations and stage management with Pittsburgh Playhouse's Kim Martin, producing director, and Alicia DiGiorgi, director of production/stage management. On the fourth and final day of the workshop, students went to the August Wilson Center with Assistant Professor David Rowell, M.F.A. Jacob Bacharach, part-time SAEM faculty member and operations manager for the August Wilson Center, led a tour of the center, including its 472-seat theatre. The workshop wrapped up with a question and answer period with Point Park admission staff members as well as a tour of campus. Students from Avonworth, Baldwin, Burrell, Central Catholic, Elizabeth Forward, Gateway, Oil City, Montour, Notre Dame, Penn Hills, Quaker Valley and Steel Valley High Schools attended this year's workshop. Additionally, Guy Angba, a student from Mohawk Valley Community College in Utica, N.Y., attended the SAEM workshop and plans to transfer to Point Park for the 2017 spring semester. "I had been looking for a program focusing on entertainment and was glad to come across Point Park's SAEM major and this workshop," he said. Angba added: "I've really enjoyed the hands-on experiences this week. My favorite part was the trip to the Pittsburgh Playhouse and seeing the equipment, playing with the instruments and touring the facility." Photos by SAEM faculty members David Rowell, M.F.A., and Paige Beal, M.B.A.